Include the UEG logo and reference to the authors on each slide you use in your presentation. 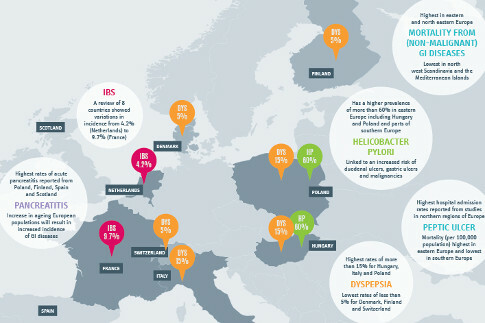 UEG has published a major pan-European survey of digestive health in Europe with the overall aim of defining and describing the burden of digestive diseases in Europe and to make an assessment of the breadth and quality of current service provision. The results of the report have revealed changing trends in many important GI and liver diseases and inequalities in the provision of healthcare services across Europe. They led to calls for greater political and public awareness of the burden of GI disorders and for more research funding. Browse the White Booklet - a summary of White Book key findings. Faced with inevitable change in our healthcare environments, and recognising the need to better anticipate and prepare for the future, UEG has been collaborating with specialist scenario planners. The outcome is a set of three plausible, relevant and challenging scenarios that may impact the delivery of gastroenterology and hepatology healthcare in the future.